The Five Love Languages of Children talks about the need for unconditional love toward your children. You might be squinting your eyes and thinking, “Of COURSE I love my children unconditionally. That goes without saying.” Well, true. I hope that is true for all parents. But there is a difference between feelings you have and feelings you show, and the interpretation of those feelings. Remember back when I talked about Leman’s book Making Children Mind Without Losing Yours ? Remember his point that the only reality that matters to your child is your child’s reality? Now, of course we as parents need to work to teach our children true reality (although true reality is subjective). But we also need to take note of our child’s personal reality, especially in situations like feeling love. You might love your child. You might even do your best to show love to your child. Now comes the most important question: does your child feel loved? How do we attain a YES to that question? First, we must identify our child’s primary love language. Remember you can’t be sure of it before age 5. Also remember that we want to make our children multi-lingual, so we want to show love in all five ways. We need to be sure we are showing love in each way no matter what the primary love language is. If our child is old enough to have a primary love language identified, pay extra special care to that love language. Next, you need to show love to our children no matter what. No matter what. To many new parents, this sounds easy. Let me elaborate. No matter how big the tantrum. No matter how many times you have told her to not touch that vase. No matter how many times you have asked him to share with his sister. No matter how many times she has whined today (has she stopped?). No matter what. Remember–show the love no matter what. This means you don’t withhold love. You allow her to cuddle up on your lap even when her actions are frustrating for you. You still offer words of encouragement when behavior isn’t up to par. You still do nice things for your child when he refuses to do nice things for his siblings. You don’t take gifts back with a “you just aren’t being very good. I don’t think I want to give this to you after all.” You still spend time with your child. Always show love. Don’t manipulate. Don’t use these ways of showing love as weapons. It doesn’t mean you can’t discipline. It doesn’t mean you can’t train. It doesn’t mean you must spoil your child. You still can, and should, discipline and train. You still want to avoid spoiling. Loving a child is not spoiling a child. This is probably a post in and of itself, but I believe that when you discipline a child, you should show your child great love afterward. This means you might take away a privilege and then sit and hold him as he cries about it. The Five Love Languages of Children asserts that when a child feels loved, discipline is easier and more effective. Do you believe that? I do! Consider this. Let’s say your spouse is unhappy with something you did. He comes to talk to you about it. Let’s say you aren’t feeling very loved. Your love language is quality time and there hasn’t been much of that going on. How sensitive are you going to be to his words? How would you feel if he said, “I don’t want to spend time with you right now. You just have really upset me so I am not going to spend time with you.” (that just reminds me of kids saying, “I am not going to be your friend anymore!”). Now let’s say you know without a doubt that your spouse loves you. He spends time with you–even sacrificing other things to spend time with you. Now how do you feel about his complaint? A bit better? Criticism is never easy to take, but always easier coming from someone you know loves you. In order to help yourself love your children unconditionally, consider these 3 obvious statements about children. This is found on page 21 of the book. Yep. Kids are kids. Sometimes that is frustrating to deal with. It shouldn’t be surprising. Adults can be frustrating to deal with. Why would kids be any different? But let’s remember that for the most part, children want to please their parents so long as they believe it is possible to do so. Children are loving and forgiving (good thing for that!). Children are wonderful. Wonderful little people trying to figure out what to do and how to do it. Keep these things in mind and show them your love at all times. No matter what. Love this post! I've seen/experienced parents who withhold love when a child disappoints them. It's definitely something we all need to watch for in ourselves. Thanks for pointing it out. I want to hear the answer to Rachel's question, too! When I tell my 12 month old "no" and/or remove her from a naughty thing she is doing, she throws a "minifit", well, as a first time mom, it is a major fit in my eyes. Although, according to some things I have read, I "ain't seen nothing yet!". Anyway, I want her to know that I understand that she is really upset, but I don't want to teach her it is okay to throw a tantrum. 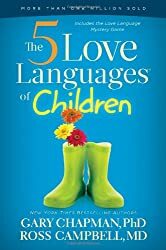 Thanks for sharing the review of The Five Love Languages of Children. I found it to be interesting. Will order my copy soon. Rachel,I think this is what I would do. I would give him a hug and say, "I know you are sad" And just hug. If he started screaming, thrashing, kicking, I would say, "I want to hug you but if you are going to throw a fit, I am not going to. It isn't nice to scream in my ear/hit mommy" etc. If the fit continued, I would say, "you are welcome to throw your fit but you need to go in [mommy's room, your room, family room, etc.]. Then enforce that. Tell him he can come out when he is ready to be happy.When he comes out, show him more love.I think a key here is to keep your emotions smooth and calm. Don't get mad at him, don't furrow your brow, etc. Stay even-tempered and be ready to give him hugs when he is ready to be done with his fit.